Saturday, September 14, The Empty Glass plays host some amazing progressive rock. 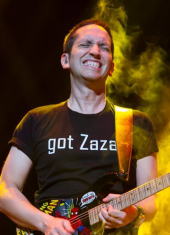 Neil Zaza with Sean O’Bryan Smith, who made our seventh-anniversary episode of Radio Free Charleston so special, will take the stage, as will the incredible French progressive fusion band, Mörglbl. …both interviews are courtesy of The Definitely Loud Podcast. Many thanks to Roadblock and Justin. Be sure to check out the Definitely Loud website for more cool interviews. The show kicks off at 10 PM Saturday at The World Famous Empty Glass. Tickets are ten bucks in advance, or twelve at the door. You can order tickets here.